Of all the hundreds of games that were released for the NES, there was none other quite like the oddity that is Heroes of the Lance. It is largely regarded as one of the worst games of all time, making several notable "worst lists", including Electronic Gaming Monthly's and Nintendo Power's. 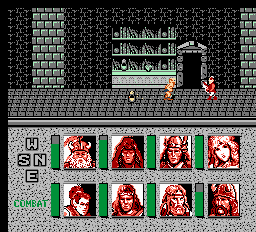 Many gamers who have played Heroes find it too difficult and frustrating to complete, which is a stark contrast to Nintendo Power's claim that it could be beaten in less than five minutes. Having finished it several times myself, I can safely say that both scenarios are an exaggeration, though the latter only because the characters move so damn slowly. 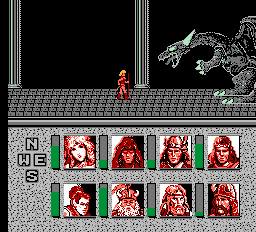 Based on a PC game of the same name (which I've never played), you take on the role of eight heroes from the DragonLance books (which I've never read), as they attempt to recover the Disks of Mishakal from the ruined city of Xak Tsaroth. What follows next is one of the biggest "how the hell could they have let it hit the store shelves like this?" gaming experiences you are ever likely to have. As you would expect from a Dungeons & Dragons game, there are also attack spells and healing spells that can be utilized if the correct characters are in the front row of the party. The spells are cast from a wand that has a limited charge, but the game is so short and the mp supply so abundant, I use the spells quite liberally and never come close to running out. If you hit upon the correct spell, (and since most are useless, you probably will), you'll find a way to pass by most enemies with impunity, which is my personal secret for beating this game. The world of Xak Tsaroth is a maze that is not really all that confounding, especially if you map it or take notes. 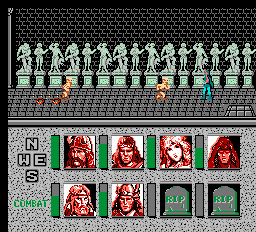 What Xak Tsaroth is, however, is one of the most dreary and bleak videogame settings I've ever seen. The backgrounds are made up entirely of four colors: black, grey, a lighter grey, and a chartreuse green. (Someone probably should have informed the graphics designer that he wasn't working for a CGA system.) It's ugly, dismal, and though occasionally it manages an interesting visual in the earlier areas (like an inexplicable giant pot on a pulley and a weird statue room), the final area consists of a bunch of sewer tunnels that all look alike and are devoid of any pits or puzzles. I'm suspicious the maze was originally planned to be larger than it is because the farther you go, the more you'll find East/West doors and North/South doors that both lead to the same room. Many items, including treasures, weapons, shields, and potions, are scattered around, but there is hardly need to collect any of them. Aside from some nice character portraits shown at the game's start, the graphics in Heroes are a mess, but the audio is more successful. Some of the music is actually rather good. The second area theme is my favorite song in the game with its foreboding tone, and the final area music is nice, too. The ending song is a decent reward for actually finishing this monstrosity. The sound effects are not spectacular, but serviceable (enemies have footsteps, spells and warps have good 8-bit quality). The voiceovers used for when you or an enemy takes damage are unfortunately cheesy. Enemies all have the same grunt when attacked, whether you're fighting a human barbarian or a spider. Even cheesier, the female in your party (Goldmoon) has the same voice clip as all the men! The underwhelming quality of Heroes's design is especially odd when considering how much effort went into crafting the manual. Written by someone who apparently did their homework on the DragonLance books, it offers long, detailed explanations of who each character is and why they're on this quest. (The game itself contains neither.) Perhaps the manual's writers were under the delusion that this was going to be a great epic game, or maybe they were compensating for its shortcomings. I didn't come away from Heroes of the Lance hating it as much as the rest of the world does. It is so odd, so unusual, and has such a unique atmosphere, that it's almost worth playing just to see how weird it is. 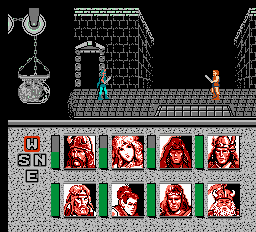 There isn't anything else quite like it, not even the Japan-only sequel, Dragons of Flame, that's advertised in the ending. Which leaves me wondering... why be so quick to foist a sequel on us when the current game was so incomplete?